Motorcycles have something over electric or hybrid cars because, you can hear them beside you or coming up from behind. That makes a difference to the bicyclists with whom I frequently share the hills and dales of winding country-two-laners near where I live and enjoy riding my Harley. My adopted home of more than two decades, Durham, North Carolina, is now not only dissected by the East Coast Greenway which runs from Maine to Florida but now recognized as the headquarters of the nearly 3,000-mile route, 25% of which is on traffic-free pathways like the American Tobacco Trail here. At times the Greenway conjoins with the recently revived United States Bicycle Route System. Unless bicyclists are very experienced, the Greenway route is still best traveled and enjoyed as excursions on short traffic-free spans while on other trips via car, bus, rail or air, where airlines now provide special boxes to carry bicycles baggage holds. That’s how I suspect most communities market the Greenway. Community/destination marketing organizations along the route can click on each state on the interactive route map to find more specific area maps at the bottom of each page. It is hard for me to believe that the idea of the East Coast Greenway only began during a 1991 conference in Massachusetts which, coincidentally, was shortly after I relocated to the southeast here to jumpstart Durham’s community marketing effort. While Durham now appears on the Greenway map, it is a bit confusing to visitors that equally-trail-rich Raleigh seems to get unusually large billing for being only connected by a spur. The East Coast Greenway actually cuts west of Cary, North Carolina and on to Fayetteville before veering down to Wilmington to follow the coastline for the remainder of the way. This is probably because the Greenway conjoins with US Highway 1 and US Bike Route 1 for a bit, and when the route and map were first created it probably wasn’t yet known that it would ultimately diverge to the west and down through Durham. USBR 1 cutting down through Virginia and into North Carolina to Raleigh is one of only two segments designated since 1981 as part of the proposed US Bicycle Route System by the Association of American State Highway and Transportation Officials (AASHTO.) Click here to enlarge the map. It appears Durham will be on a future east-west BR. Recently several additional routes, USBR 1 in Maine and New Hampshire and USBR 20 in Michigan and USBRs 8, 95, 97 and 87 in Alaska, have been approved. If you wonder what “experienced cyclist” means, try driving anything motorized down US 1 through nearby Raleigh and you’ll get an idea of the experience needed to maneuver through congested areas. The FastLane blog a week ago on the US Department of Transportation website and a FAQ on the website for the Adventure Cycling Association which has been contracted by AASHTO to facilitate more route designations to the system indicate that 44.7 million Americans age seven and older rode a bicycle six or more times in 2008. Bicycling is now the seventh most popular recreational activity in the nation. Click here for Adventure Cycling resource page with links to various studies on economic and community benefits. According to a post a few days ago on the website GOOD, Americans made 4 billion bicycling trips in 2009, up from 3.3 billion in 2001. To put that into perspective there are now between 10 and 11 million motorcycle trips annually in the US. From my observations, we share the road together much better than automobiles do. 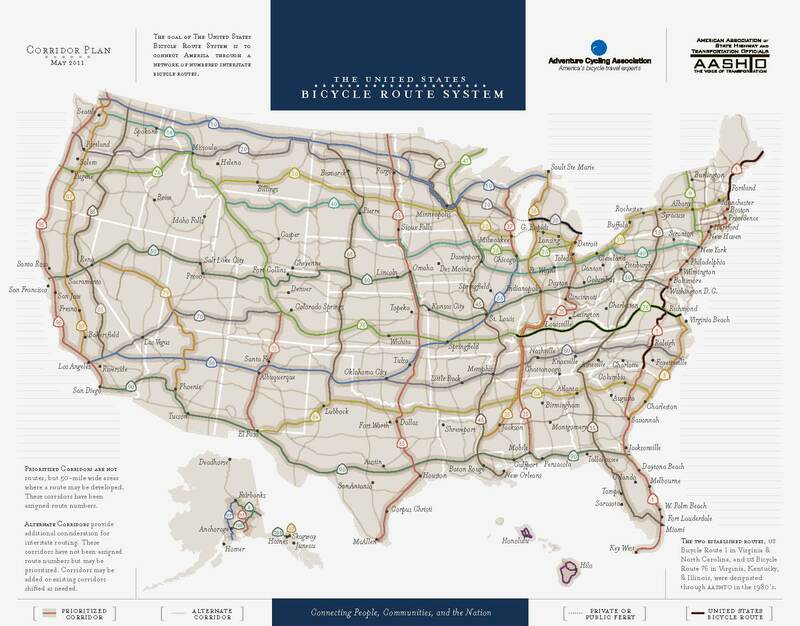 Click here to search the US Bicycling Route Map by state or by route which is probably the most useful for the majority of bicyclists who would use part of the system during a trip. It is also a good place for official community destination marketing organizations to find specific links to the appropriate segments. Click here for links to various Durham maps showing local routes for biking and hiking, the locations of bicycle racks or overall greenways and trails.